Milt Dienes shows some of the work of his on display in King of Prussia for the next month./ Photo courtesy of Milt Dienes. 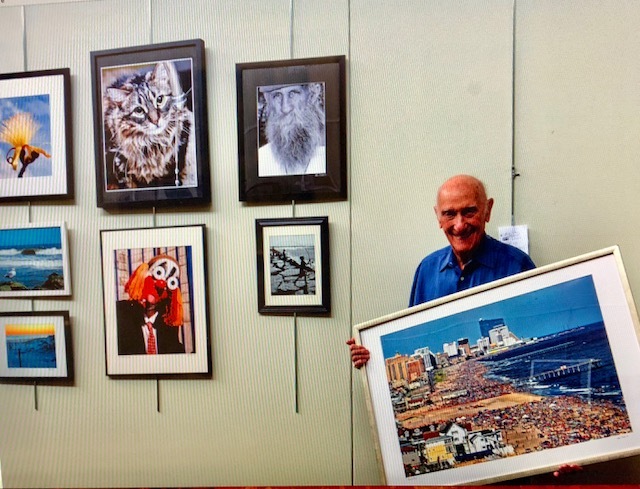 A photography show at the New Upper Merion Community Center is featuring award-winning works by photographers including Central’s Milt Dienes (177). Dienes served in the Army during World War II and was dispatched to Nagasaki, Japan, immediately after the U.S. dropped an atomic bomb there in August 1945. Dienes’ compelling, exclusive pictures are preserved in the Library of Congress. The show, at 422 W. Valley Forge Road ( Rte 23), King of Prussia, Pa., features more than 100 prize-winning photographs by members of The Upper Merion Club, of which Dienes is an active member. “It is an outstanding collection of photography at its best,” says Dienes. The show, which began on July 28, runs to Sept. 1 and features 13 of Dienes’ pictures. Meanwhile, Dienes, 94, is also organizing a 76-year reunion for his class. Last year seven members of Central’s class of January 1942 came together at Central, one from as far away as Florida, to reminisce and talk about their lives since graduation. This entry was posted in All News and tagged Milt Dienes Central High School of Philadelphia, Milt Dienes Library of Congress, Milt Dienes photographs. Bookmark the permalink. WELCOME TO THE AACHS WEBSITE! The Associated Alumni of Central High School is a 501(c)(3) nonprofit organization. Accordingly, your contributions are tax-deductible to the extent allowed by law.